The Battle of Gettysburg, which occurred from July 1st-3rd of 1863, was one of the deadliest fights of the Civil War and marks the beginning of the long and painful Confederate withdrawal and ultimate defeat in 1865. In observance of the battle’s 75th anniversary, the Pennsylvania State Commission sought to have a commemorative coin issued to honor the memory of those who fought and died. 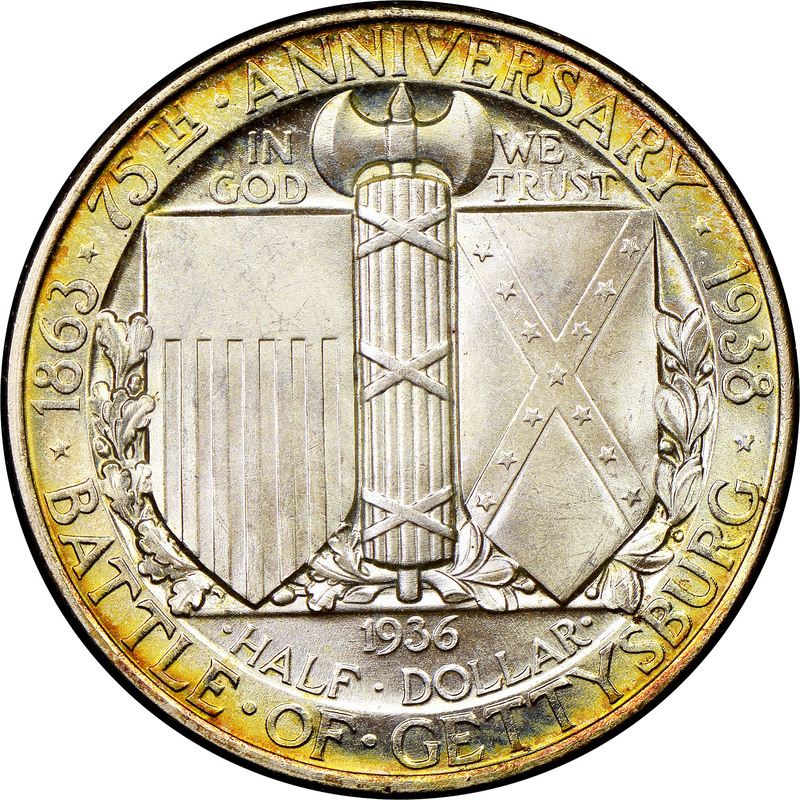 They were successful, and legislation was passed on June 16, 1936 which called for the minting of no more than 50,000 half dollars commemorating the battle. The Commission hired Philadelphia sculptor Frank Vittor to design the coin. In a departure from most of the commemorative coin programs of the era, Vittor’s original models were well-received by the Commission of Fine Arts from the onset. 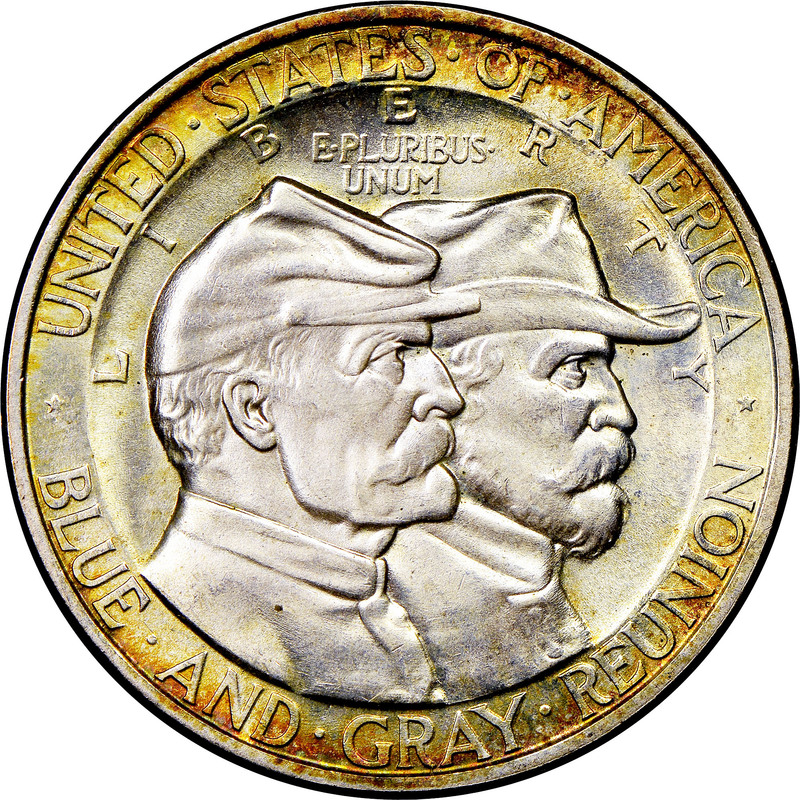 One of the only major issues that the Commission had with the coin was the similarity between the Union and Confederate soldiers on the obverse. This might have actually been an intentional nod towards the Civil War theme of brother against brother and was not changed. Final approval of the design was given on March 24th, 1937. The dies were then prepared in Philadelphia, and the maximum mintage of 50,000 was produced at the Mint there in June. 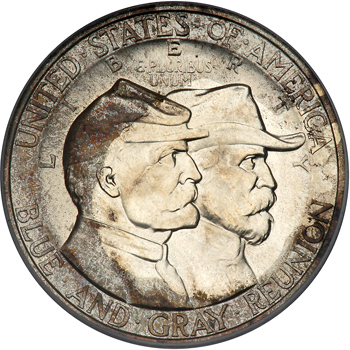 Vittor’s obverse design portrays conjoined busts of Union and Confederate veterans in uniform facing right. Above are the mottoes LIBERTY and E•PLURIBUS•UNUM. Arranged in arcs around the periphery are the legends UNITED• STATES•OF•AMERICA and BLUE•AND• GRAY• REUNION, separated by stars. 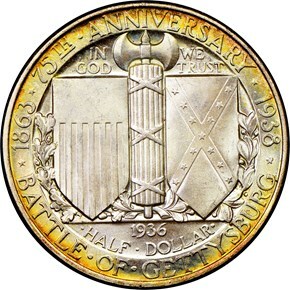 The reverse is dominated by Union and Confederate shields, separated from one another by fasces. Wrapped around these elements are branches of oak and olive, perhaps symbolizing war and peace. The date 1936 appears below; this was specified in the enabling act, though it has no other relevance to this coin. Below the date is the value •HALF•DOLLAR•, while above the shields is the motto IN GOD WE TRUST, separated by the blades of the fasces. Around the periphery are the inscriptions 75TH•ANNIVERSARY and BATTLE•OF•GETTYSBURG and the dates 1863 and 1938, all separated by stars. 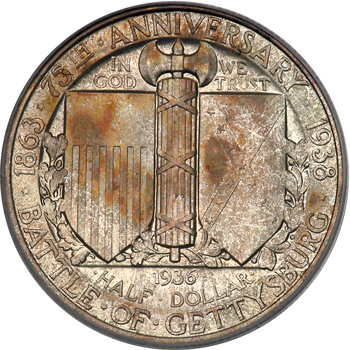 The coins were originally sold for $1.65 a piece by the Pennsylvania State Commission during late 1937 and continuing through the Blue and Gray Reunion of July, 1938. After the event, the remaining coins were transferred to the American Legion in Pennsylvania. In attempt to make the coin seem more desirable, the price was raised to $2.65. Unfortunately, this didn’t help sales, and the remaining 23,100 pieces were returned to the mint for melting, leaving a net mintage of 26,900 for this now-popular issue.